When you submit your app to the Android Market, you first need to register with the service using your Google account and agree to the terms of service. Once you are registered, you can upload your application to the service whenever you want, as many times as you want, and then publish it when you are ready. Once published, users can see your application, download it, and rate it using the Market application installed on their Android-powered devices. An example of the Android Market developers site instructions is shown in Figure 8.2. Figure 8.2 You can upload your app make it available on the Android Market at anytime. 1. 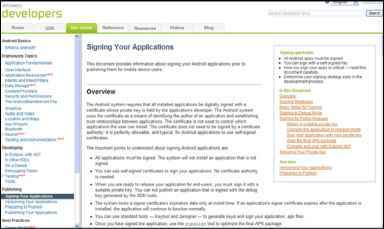 Your application must be signed with a cryptographic private key whose validity period ends after 22 October 2033. 2. Your application must define both an android:versionCode and an android:versionName attribute in the <manifest> element of its manifest. The server uses the android:versionCode as the basis for identifying the application internally and handling updates, and it displays the android:versionName to users as the application's version. 3. Your application must define both an android:icon and an android:label attribute in the <application> element of its manifest.